Antiplanes catalinae, copyright Peter Egerton. 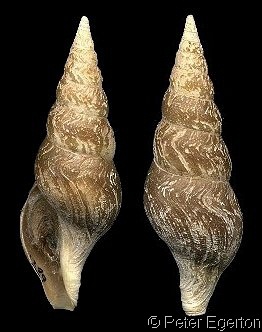 Antiplanes is a genus of conoid gastropods found in moderate to deep waters of the North Pacific (Powell 1966). See also: A whole new twist on things, or just shifting back and forth? Characters (from Powell 1966): Shell dextral or sinistral, often rather large, up to 55 mm, with tall narrow spire of rounded whorls and relatively short, flexed, unnotched or weakly notched anterior canal. Protoconch small, smooth, paucispiral and globular with asymmetric inrolled tip. Adult sculpture of more or less well developed spiral striations, or weak sigmoid growth threads with obscure spireal on base; whole surface covered by thick periostracum. Sinus moderately deep, broadly open, extending from suture to below periphery, with apex of sinus immediately above greatest peripheral convexity. Operculum leaf-shaped or claw-shaped with terminal nucleus. Radula with vestigial central tooth, and pair of wishbone-shaped marginals with distal basal limb severed.